by Maselli, Christopher P. N.
Students can join super sleuths Mick Gumshoe and Nova Shrewd as they look for clues and discover that solutions to life's problems can be found in God's Word. 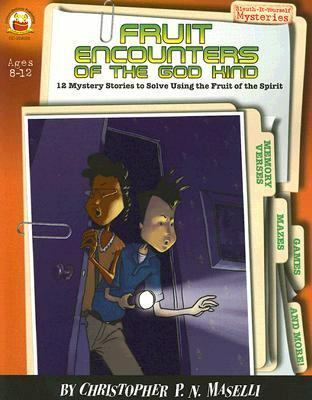 Perfect for Sunday schools, Christian classrooms, clubs, and midweek, each of these 12 reproducible lessons include an activity, a memory verse, and open-ended questions that help kids put Biblical truths from the stories into practice!Maselli, Christopher P. N. is the author of 'Fruit Encounters of the God Kind Ages 8-12 12 Mystery Stories to Solve Using the Fruit of the Spirit' with ISBN 9781594413810 and ISBN 1594413819. Loading marketplace prices 4 copies from $7.02 How does the rental process work?